APpsc Hall tickets for Various posts Recruitment, Hall tickets Download at psc.ap.gov.in: Andhra Pradesh Public Service Commission (APPSC) has released hall tickets for Assistant Chemist, Assistant Director in A.P. Town and Country Planning, Town Planning Assistant in A.P. Town & Country Planning, Agriculture Officers in A.P. Director of Agriculture and Royalty Inspector posts. 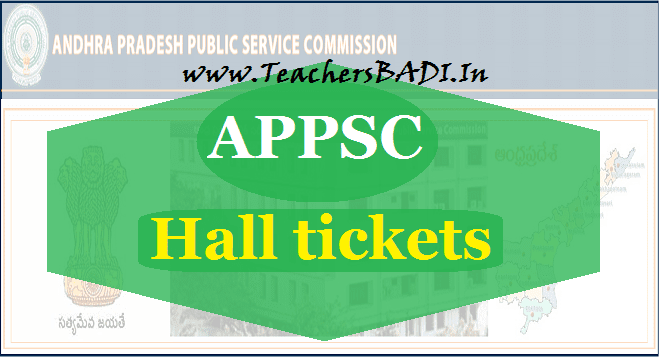 Candidates who have applied for the same can now download the hall tickets from the official website of Andhra Pradesh PSC at psc.ap.gov.in. The GS and MA paper for all the posts mentioned above will be held on 8 April 2017. The Commission had notified about the change through an official notification taking the dates of Sriramanavami and Jagjivanram jayanthi festivals into consideration. For Notification No's 30/2016- Assistant Chemist,31/2016- Assistant Director in A.P. Town and Country Planning, 32/2016-Town Planning Assistant in A.P. Town & Country Planning, 33/2016 - Agriculture Officers in A.P. Director of Agriculture, 35/2016- Royalty Inspector Hall Tickets are Hosted for download"
How to download the APPSC hall ticket? In view of Sriramanavami and Jagjivanram jayanthi festivals on 05/04/2017 the schedule of below mentioned notification examination dates are rescheduled as mentioned at column No.5.